Hi ya’ll! I’ve been crazy busy lately, working during the day and then working from home evenings and weekends, along with having a life on top of that! Recently, I had a 20% off coupon for Ulta and I used it to buy a bottle of Urban Decay’s Naked Skin Weightless Ultra Definition Liquid Makeup. I love this stuff! At $39, it’s not the most affordable option in the makeup aisle, but the formula is amazing! I wouldn’t describe it as sheer or matte, it almost has a satin finish. It truly feels like naked skin – my skin, but better. And isn’t that the ultimate goal of foundation anyway? I purchased the 3.5 shade, which is described as “light beige with slight pink undertone.” Naked Skin foundation comes in 18 different shades and I would suggest going in-store to test out what works best for you. I had received a sample card with four different shades from an online order, so that’s how I decided my best shade. No makeup on the left. Wearing only Naked Skin foundation on the right (blended with a foundation brush). See the difference?! 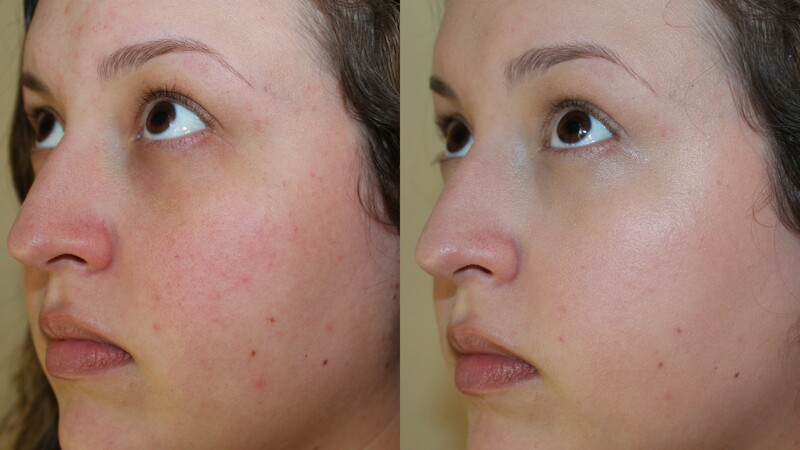 It evened out my tone, covered small blemishes, while letting my skin shine through. It doesn’t feel heavy, cakey, or greasy. It just has a nice feel to it, not quite matte but not dewey either. Urban Decay describes it as “demi-matte that feels invisible but looks professional retouched.” I used about a quarter-to-half of a pump for one side of my face. In addition to this, I would add under-eye concealer and a light dusting of face powder (I used Ulta brand for both of those). This is definitely an awesome beauty buy that I highly recommend! Thanks for the review. Have also been thinking of trying this out. You’re welcome! It really is an awesome product. 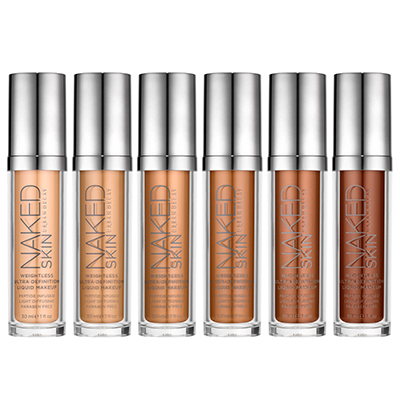 UD loaded Naked with a lot of skin-improving ingredients too, it’s listed on their website. I’ve been eyeing this product for a while and was wondering what kind of skin type you are and how you think it worked for that skin type? I have combination/oily skin how do you think it would work for me? I have normal-to-dry skin, so I like this makeup because it doesn’t emphasize any dry patches and doesn’t make my skin feel tight and uncomfortable. I think it would work well with combination/oily because the “demi-matte” finish would facilitate in mattifying shine where you need it. It is also listed as free of oil, parabens and fragrances, so it shouldn’t clog your pores with anything else. The finish is fantastic! Looks great on you!